Jesus – Grieving Over the Religious..
One of the most important things to me is that my boys know who Jesus is. Part of knowing who Jesus is requires us to study and dive into what he did in the scriptures. What we find is a Jesus who is committed to the work of the Father. In Mark 3:5 we also see Jesus responding to the Pharisees that highlights his humanity. One of the great mysteries of theology is that Jesus is both fully man and God. This mystery should lead us into worship of our great God. In Mark 3:5 we see that Jesus feels two common human emotions “anger” and grief”. Jesus has human emotions, and feels deeply. Diving into the Greek text (thanks to Logos 5 for the research help!) 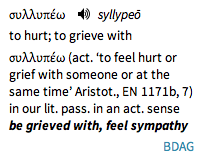 we see that the Greek word “Syllypeo” is being translated as the word “grieved”. This word literally means to feel sympathy. When referring to anger, the greek word “Orge” is being used which refers to relatively strong displeasure with a focus on the emotion anger. In this one sentence we see Jesus expressing two seemingly opposite emotions. Jesus was angry with the Pharisees for their insensitivity to suffering while also grieving over the condition of their hearts. Jesus’ anger and grief teaches me the following. Don’t forget the Gospel – While these religious leaders are consumed with hatred for Christ and waiting for the opportune moment attack, they miss their calling. As the religious leaders it is their responsibility to represent God. To do His will and care for others. It’s easy for us to get consumed with things that pull us away from Gospel. Do good – Jesus asks if its right to do good or harm, to save or to kill. In the very next verses Jesus answers this question with an action. He restores the mans hand. It’s simple, do good. Start with your family, your wife, husband, children, mom, dad, and siblings. Do good in your community (including the neighbors you try to avoid cause they annoy you). Be a reflection of the Gospel of Christ. This entry was posted in Leadership, Theology and tagged Anger, Christ, church, Do Good, Emotion, Gospel, Grief, Jesus, religion, Theology by jmuddamalle. Bookmark the permalink.